Professional Service / FAST Return Shipping / WARRANTY!! If you are experiencing the Pixel Loss & Display Failure problems with your AUDI Speedometer Cluster, it is time to fix it once and for all!! 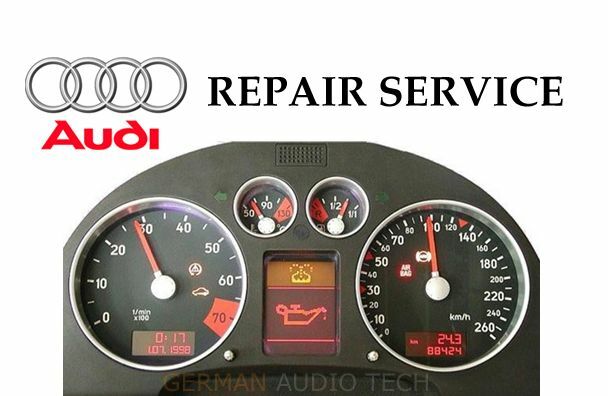 This listing is for the purchase of a SERVICE to repair your 1999-2004 AUDI TT (MK1), 1998 - 2001 (B5) A4, S4, 2000 - 2002 (C5) A6, 1999 - 2004 AllRoad instrument cluster center display readout. Trust the BEST!! We have over 10 years experience working with these highly-problematic displays and have repaired hundreds since. We only the highest quality replacement parts and processes. Your instrument cluster is programmed to your vehicle which is why we advise having your original equipment repaired back to new at a fraction of the cost of a dealer replacement. Because we use the highest quality replacement parts and processes, we can offer such a substantial warranty to you! Have a question? Please send us a message or call our customer support at (562)786-5312. We are happy to help! Both GLASS and RIBBON are replaced with brand new parts. Please Note: If you have pre-existing conditions other than what is listed above, we do not repair them - just the entire center display. Remove driver's storage compartment or padded knee panel. Knee Panel: remove the two torx bolts near the gas and brake pedals. Grasp the bottom edge of the panel and 'pop' it towards you (quick pulling effort); it will detach from its clips at the top, allowing the top to drop enough to access the two screws -1- in the next step. The knee panel requires no further removal. Place a towel or cloth over steering column to prevent scratches to the trim. Pull out instrument cluster from the front. Release/cut cable ties on rear of cluster. Disconnect the blue, grey, and green electrical connectors using a flat screwdriver to lift the purple retainer catches. Squeeze the retaining lever on the remaining white connector, exiting from the cluster's microphone, to disconnect.